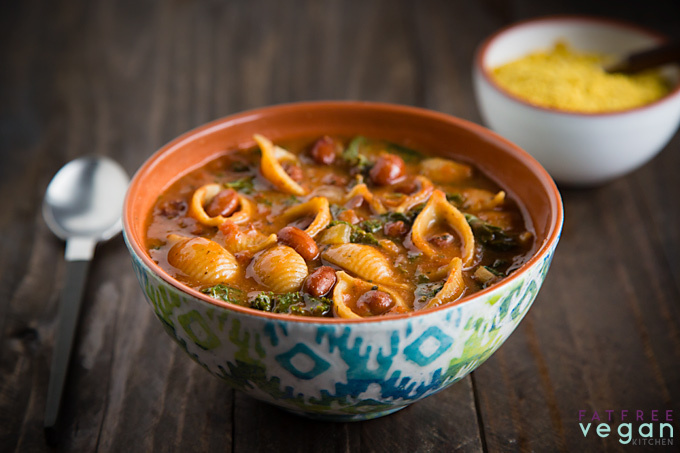 This low-fat, vegan pasta fagioli, the traditional Italian pasta and beans soup, is thick and delicious. Using an Instant Pot speeds it up! Since the weather got cooler, I’ve been making a lot more soups and stews. And since I’ve been test-driving a new Instant Pot (more about that in an upcoming post), I’ve been pressure cooking a lot of dried beans. So it was only natural to use my new gadget to make a soup/stew starting with dried beans. But don’t worry–you don’t have to have a pressure cooker to make this thick, Italian-inspired soup because I’ll tell you how to make it in either a pressure cooker or in a regular pot on the stove. Cranberry beans are pretty when dried but lose their vibrant color when cooked. I’ve had these beautiful cranberry beans sitting in a jar in my kitchen for a while, and though they make for an attractive decoration, beans do get old and should be used before they’re eligible for social security. 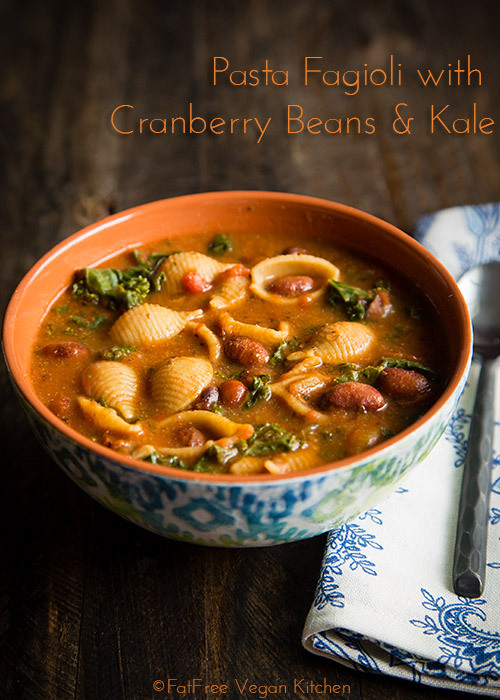 So when I saw a Food Network recipe for Cranberry Bean Pasta Fagioli, I knew I had to make–and veganize–it. And pressure cookerize it. And fatfree-ize it. You get the picture. By the time I got through doing all that and doubling the amount of beans, it wasn’t much like the original. But it was delicious. 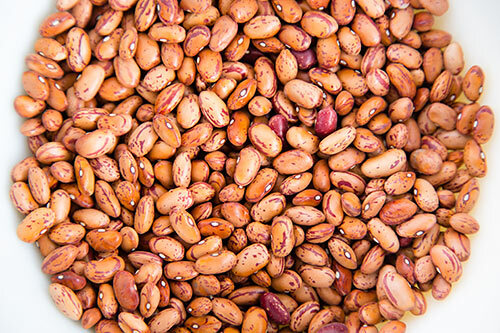 You don’t have to go searching for cranberry beans if you don’t have them because this recipe works just as well with pinto beans (cranberry beans have a slightly nuttier flavor, but with all the other flavors in this soup, I doubt you’ll notice). I used whole wheat pasta, but any pasta, including gluten-free, will do. I also used tomatoes from a box to avoid BPA, but you could use one of those big cans of tomatoes if you prefer. And I have a big rosemary bush right outside my kitchen window, so using fresh is easy for me, but you could always substitute dried. I was actually very surprised at how much my family loved this dish. I’ve made other “pasta and beans” dishes, but this is one of the few times I’ve started with dried beans, and I really think it makes a difference. Lately it can be hard to get my daughter to eat beans, other than chickpeas, so I was thrilled when she liked this so much. I served it with a large chopped salad and that was all we needed for a hearty meal. Be sure to check out my other pressure cooker recipes, all of which can be cooked in an electric or traditional pressure cooker. Using a pressure cooker cuts the time it takes to cook dried beans by about half, but I’ve also included regular cooking directions at the end of the recipe. Heat your pressure cooker (use the Sauté or Brown button on electric PC’s). Add the onion and a pinch of baking soda (optional) and cook until it begins to soften, adding water by the tablespoon if necessary to prevent sticking. Add the celery, half of the garlic, the rosemary, and the red pepper flakes and cook for another 2 minutes. Add the tomatoes, 2 teaspoons of basil, 1 teaspoon oregano, and the smoked paprika. Heat, stirring, until hot. Add the drained beans, 6 cups of water or vegetable broth, and salt, if you desire. Lock the lid in place, bring to high pressure, and cook at high pressure for 10 minutes. (Electric PC’s: select Manual and set the time to 10 minutes.) After 10 minutes at high pressure, remove from heat or turn off electric cooker and allow the pressure to come down naturally for 15 minutes. Release all pressure using a quick release. Carefully open the lid and check the beans. If they are not all completely softened and cooked, replace the lid and bring to high pressure for another minute or two. Quick-release pressure and check beans again. Do this until the beans are all tender. Once the beans are done, add the reserved garlic, basil, and oregano and check to see if additional salt is needed. Add the pasta and return to medium heat (electric PC–use Sauté or Brown setting). Cook, stirring frequently, until the pasta is almost al dente–just a touch undercooked. Stir in the kale, turn off the heat, and cover the cooker. Allow the kale to cook in the residual heat for about 5 minutes. Check kale and pasta for tenderness and add more time if needed. Stir in nutritional yeast and freshly ground black pepper to taste and serve. Follow the directions in steps 1 through 3, using a large, heavy pot. Then add the dried beans, salt, and 8 cups of water or broth. Cover and bring to a boil. Reduce the heat to low and simmer until beans are tender, adding more water if necessary. Allow 1 1/2 to 2 hours for beans to cook. Uncover the pot and bring back to a boil. Add the pasta and reserved seasonings and check the liquid level–there should be enough to cover the pasta completely; if not, add more. Cook until pasta is al dente. Add the kale, cover the pot, and cook on low for 3-5 minutes. Add nutritional yeast and black pepper to taste. 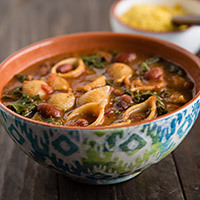 Nutritional yeast gives this soup a savory umami flavor that replaces the Parmesan cheese used in traditional Pasta Fagioli recipes. But it has come to my attention that there have been studies (such as this one and this one) that raise the concern that high amounts of synthetic folic acid may increase the risk of breast cancer. Most brands of nutritional yeast do contain added folic acid in varying amounts, and while using a little every now and then is probably not a problem, if you use a lot, you may want to read labels carefully and choose brands that contain as little folic acid as possible. For the past few months, I have been using Foods Alive brand, and I like it a lot. Plus, it’s less expensive than Sari Foods, the other popular unfortified nutritional yeast. Question- if using a crockpot for this, at what point would I add the pasta? I’m not a crockpot expert, but I’m guessing that you would add uncooked pasta during the last hour of cooking. Or you could cook the pasta and add it during the last 15-20 minutes. I made this tonight and it was fantastic. I added my kale and noodles together and then cooked it 5min at pressure and both the noodles and kale were perfect. We added sriracha and some hemp seed parmesan at the table. Yummy! Excellent, I’ve been looking for a recipe that uses shells pasta. Those cranberry beans look lovely! I’m glad this is a pressure cooker recipe too, it sure can make food prep a lot less time consuming. And I’ve heard mixed reviews on nutritional yeast before, so thanks for the note. Thanks for that unfortified nutritional yeast link, Sharon. I order this one from Amazon, and expect it tomorrow. Good to know there’s another out there just in case..
I’m glad I did. Just delicious. This recipe tastes wonderful and was a huge success with my taste buds! The flavors are amazing and the nutritional yeast is a must… it’s an excellent add in! My husband enjoyed it as well and said so; and, truth be known, if he was left to his own, he might go back to eating meat and potatoes so that’s meant as a super compliment!!! I only had pinto beans on hand the day I came across the recipe; but this week I’m hoping to make it with cranberry beans since I’ve never tried them before. Our thanks to you, Susan! Made this recipe tonight using the pressure cooker. Had to make a few adjustments for personal taste and not having all the ingredients. We loved it. Definitely make it again. When the husband goes back for seconds you know you’re on a winner! I am interested in buying a rice cooker and have been looking at the Zojirushi models but started considering an instant pot. I wonder if you have experience with both of these types of appliances and what your impressions have been. I am mostly interested in having something for cooking brown rice which we eat regularly. This recipe was a big hit with my husband who loves lentils and pasta–made it with pinto beans and it was very yummy. I probably made this more complicated than it had to be since I sauteed the onions and celery on the stove then added the tomato and spices, heated it through and put it in the Insta-Pot. I have never used the saute feature on my pot. I used pinto beans and spinach as that is what I had on hand. This soup is very good. It is thick like I have had in restaurants. I added a bit of garlic salt and did sprinkle with nutritional yeast to serve. A very satisfying soup. Thank you ~! This is a FANTASTIC soup recipe. I think I could make it and eat it every day. I think the seasonings are the reason – they are just perfect. Thanks so much for this outstanding recipe. This is the first whole meal I’ve produced in the pressure cooker. It was fun discovering the saute setting and keeping my pans clean in the process. I wish I could pinpoint what is so fantastic about this recipe, but I cannot. It is one of the best things I have ever made (and I am a pretty accomplished cook). It is absolutely delicious! I soaked the beans while I was at work, and cooked them for the first time this evening in the soup. They were as soft as can be. I used quinoa pasta because I am GF, and it was a good choice because the noodles didn’t cook too fast or get too soft in the warm soup before I put it away in the fridge. I cooked this using the electric pressure cooker and not only was it simple but it was absolutely delicious! Thank you very much for sharing! This soup is just so good…..and to be honest, I’m not the biggest fan of kale but this soup is so tasty, so well balanced I don’t even mind the kale. You rock! This soup was so yummy and bursting with flavor! Definitely going to be a part of my weekly dinner menu. I am not really vegan, so I used Parmesan instead of nutritional yeast. I use a software program that adds up all the nutrients and divides by the number of servings. Sorry for all the questions but how did u get 1.6gram of fat per. Serving of one person?? The nutrition software adds up all the nutrient values in all the ingredients and divides by 8 to get the info per serving. If you look at just the major ingredients, 2 cups cranberry beans have 4.8g fat, pasta has about 3, kale has 2, and tomatoes have 1. All of these plus the traces of fat in the other ingredients are added up and divided by 8. It isn’t exact, but it’s close enough to give a sense of how many nutrients you’re getting. I hope this explains it. So how in one serving size is it only 329 and 1.6 grms fat is that also good for you?? I have tried to answer your questions, but I am not sure what you are asking. A serving is 1/8 (one eighth) of the entire pot of soup. The nutritional software adds up all the calories in all the ingredients and divides by 8 to come up with the number in 1/8 of the recipe, 329. The same goes for fat, carbs, and all the other macronutrients. I would say 1.6 grams of fat per 329 calories is very good for someone following a low-fat diet. would love to make it tomorrow for party, hopefully my friends will enjoy it. One of the Whole Foods in my town has bulk Nutritional Yeast that contains NO folic acid. The other store as well has it in bulk, but that one DOES contain folic acid. Go figure………….. Thank you Susan for your dedication to healthy food and this web site. Your recipes have been a real inspiration to me. I especially LOVE your Louisiana Red Beans and Rice recipe. You help me stay healthy! I can attest this was excellent – so yummy! Thank you. I am hoping to make this today – does anyone know if it is spicy for kids? my eight year old is a picky eater and won’t touch something if it’s spicy. unless it’s salsa – and even then it’s iffy. if it’s extremely mild I might be ok… or maybe I should leave it out? also – I don’t have Kale on hand – have spinach (not sure if it’s still good) and spring mix.. either of those a good sub? I don’t consider this spicy at all, so I think you should be safe. But tastes vary! Please let me know what your kids think. If you use spinach to spring mix, just stir it in at the very end and cook until wilted. Should be fine. I just found this recipe and made it tonight. It is delicious! Thanks so much for creating and sharing! This is delicious – had beans in the freezer and used them- had some tomato stock so added that to veggie broth. Had spinach instead of kale. This is a keep – total comfort food. Sari Foods Company also offers a non fortified nutritional yeast. I found it when looking up the ones you suggested. Ugh. Sorry. I just saw the other post who already commented on the Sari brand. This is hands down one of the BEST soups I have ever eaten! Seriously. 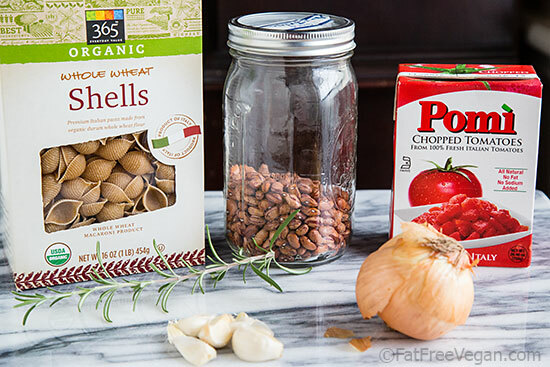 This has definitely gone into my staples/will make often favorites! THANK YOU for sharing this! I use Sari Foods Company Natural Non-fortified Nutritional Yeast Flakes, from Amazon. It tastes very good, and does not contain Folic Acid. I haven’t tried the soup recipe, but plan to. Sounds delicious. Thank you for this yummy dish. We had this for dinner last night and it was a big hit. I will definitely add this to my IP file. I can’t quit making this soup! It is delicious, especially during the cold weather we’re experiencing in Louisiana. Thanks, Susan! Nice original recipe,combine pasta and beans is quite popular in many countries but this way to do it is very different. Love this soup! I used chickpea pasta and added it to the PC for 3 min at high pressure at end with the kale and it turned out perfectly! Thank you!! I just made this recipe….. again! Every time I make it, my family raves about it. It has been a good year since my last batch, as I moved to NZ at the end of US Fall which is NZ Spring, and this has always been a Winter comfort dish. As I sat freezing in my lounge this morning, I suddenly had the motivation to make it till dinner, because I remembered this soup. It is just so good, and my family once again remarked at how good it is. I cheated today and used canned chickpeas – added them after I pressure cooked the broth for only 3 mins, since there were no beans to cook. Thank you for such a great recipe, and for helping me get through a cold, wet day. Oh my goodness! I made this for dinner this past weekend and we just loved it. A nice hearty soup that I will definitely be making again. Thank you for sharing this.